Active Network Management (ANM) is an essential component of the smart grid and is therefore one of the integral solutions in our project. ANM creates an intelligent energy infrastructure providing automated control of various components of the energy network and provides the information needed to ensure that all the new technology is controlled in an optimal manner. 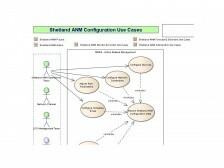 The Active Network Management Use Cases (on the right) have been created to describe ANM and how it is used in Shetland, or click on one of the options below to find out more. What is Active Network Management (ANM)? Active Network Management is core to the creation of a smart grid. It will facilitate connection of renewable generation, full and efficient use of energy storage and will allow energy supply, generation and demand balancing.